Born Gabor Hegedus in 1948, his family fled Hungary and the political revolution there to England when he was only 8. Music didn't become a factor in his life until moving to Toronto at age 23. Gabor became a staple of the local underground scene during the late 70's, where his industrial pop/punk sound was pretty much the 'norm'. His self-titled debut was released by Anthem Records in the spring of 1980. Co-produced by Terry Brown, whose work included among others Stampeders, Max Webster, Klaatu and Rush, it showed an instant sense of maturity, backed by the success of the two singles, "Metropolitan Life" and "Soviet Jewelry". 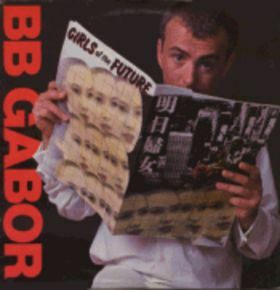 Gabor made two cross-Canada tours, and enoyed the success of other hits from his debut including a remake of Joni Mitchell's "Big Yellow Taxi", "Lazer Love" and the social commentary "Hunger Poverty and Misery". Gabor's youth in the middle of a communist regime was also made known in "Soviet Drug Club". GIRLS OF THE FUTURE hit the stands a year later. Produced by Gene Martynec, who'd worked with such Canadian stars as Edward Bear and Rough Trade, it continued along the veins put forward by its predecessor. The first single released was "Jealous Girls", a cover of the Extras' hit, which was followed later in '81 by "Little Thing." Also on the record was some of Gabor's most tightly-written music, including the upbeat "Keep On Dreaming" and "Shake", co-written by Jimi B. After being cut from Anthem's roster in '83, Gabor's career came and went in spurts, but continued working in the industry the remainder of the decade. Some of his credits included production of The Extras, Ron Hedland and Jimi B, as well as doing session work with Todd Rundgren. Though he reformed a touring group in '87, he was finding the music scene had no room for his brand of pop. In 1990, Toronto police found Gabor dead in his apartment, the victim of an apparent suicide at the age of 42. BB Gabor's life was one marred with tragedy, from his childhood in war-torn Hungary, to his struggling just to survive in England, working as a cab driver and even dabbling as a broker in precious metals, to his humble beginnings in the Toronto music scene, to his untimely demise. Though he only recorded two records, he left his mark on the industry by working with some of the industry's best, as well as writting some of Canadian pop's most cutting-edge music.